Did you know that one in five Georgians struggle with hunger on a daily basis? And, approximately one in four residents of northeast Georgia do not know where their next meal will come from. This is a real issue for many people in Georgia and more specifically in Athens. But, what if there was an easy way that you could help encourage others to fight hunger just by sharing what you already donate to food banks? Wouldn’t it be cool if you could help restock food banks with healthy options just by using a mobile application while doing your regular grocery shopping? Well, that’s what the Victus team is trying to accomplish! Our goal is to use technology to encourage people to donate healthy foods and help improve the lives of those in need. We want to make it as easy as possible for consumers to share how they support their local communities with food donations. The Victus mobile application will be mainly used by those who are frequent visitors to grocery stores and those that often choose to participate in food donations. The app will give users the ability to share their good deeds and donations on social networking sites, thereby encouraging their friends to do the same. We believe that by sharing the knowledge that people are making contributions to food banks it will lead to a chain reaction of others stepping in to help out with fresh food donations. After coming up with our initial idea, the Victus team is now hard at work designing and developing the application. We are creating a web application using jQuery and HTML that we will then use later on to add in a camera feature by importing it into Red Foundry. The camera feature will be incorporated into the application so that users can share photos of the items they donate. The app will also feature a list of participating stores, healthy food donation suggestions, locations of local food banks and a tracking system that allows the food bank to know when items have been donated. It is our hope that future improvements to the app will include a profile system allowing users to collect points for the donations they make. 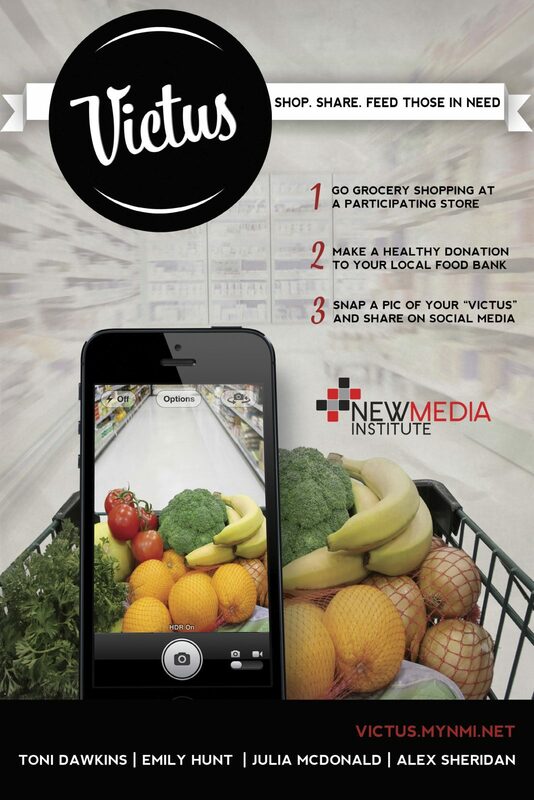 So if you want to learn how you can help restock food banks and encourage others to follow your good deeds, then join us as we shop to feed the need with the Victus app.